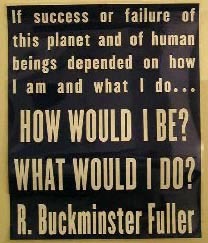 A famous Bucky Fuller quote. It somehow makes a quote more important when somebody makes a sign out of it, so here. How would you be? What would you do? If it really depended on you. How about this also "What would Humanity Do? ..saying they'd nuke Iran & others saying they'd set themselves on fire for peace. 16 Aug 2005 @ 19:15 by ming : What to do. Ha, yes, of course. Some people are doing it. Thinking it is all up to them, and then choosing some completely nutty course of action, in order to affect the course of history. I, uhm, guess that's not quite what I was looking for. But I guess most people haven't really thought about the possibility that they might actually do something that really would influence humanity. And since they think it doesn't make much difference anyway, they might think they're except from really have much responsibility for what they do. within ours and the planets means might mean. 17 Aug 2005 @ 13:09 by jstarrs : I apologise for.. I suppose most people haven't really thought about the possibility that they might actually do something that really would influence humanity because we're all busy trying to satisfy our own needs. and then later, if necessary, I can say this is what I have done. each of us in our heart needs to deal with. What I would have is my voice. The Strawman was looking for a brain, the Tin man was looking for a heart, the Lion was looking for his courage, and if I were to meet Dorothy on that Yellow Brick Road, I would tell her that I was still looking for my Voice. Whether as artistic or literary expression, or in the way I am using my vocal cords, bringing forth the spirit of what I think and feel to the ears, eyes, and minds of whomever is within my domain is the goal, what I want, what I would have, I have been working on ever since I can remember, and whatever I wind up actually doing, will be something furthering the range of expression of what I feel and know in my heart and mind. 18. Sprouting in Para, Vak (power of speech) gives forth two leaves in Pasyanti, buds forth in Madhyama and blossoms in Vaikhari-that Vak, earlier described, reaches the stage of the absorption of sound, reversing the above order, viz., beginning with Vaikhari, etc. 19. Para, Pasyanti, Madhyama and Vaikhari, are the four kinds of Vak. Para is the highest of sounds. Vaikhari is the lowest of sounds. 20. Vak begins from the highest of sounds to the lowest, in evolution. 21. In involution it takes a reverse order in order to merge in Para or the highest subtle sound. 22. Anyone who thinks that the One who is the great Lord of that Vak, the undifferentiated, the Illuminator of that Vak is the Self-such a person who thinks over thus, is never effected by words, high or low, good or bad. Sound is classified into four stages : para, pasyanti , madhyama and vaikhari . In an evolutionary sequence, these display the structure of the continuum of manifestation. Para sound, at the unmanifest stage, is the starting point. When the para sound is elongated in different directions, it becomes pasyanti . In other words, pasyanti sound is sound emerging towards the visible. After the stage of pasyanti , sound begins to crystallise into form. At this stage, sound becomes light or pasyanti becomes madhyama , the luminous sound. By creating patterns and curves, luminous sound make the enclosure and definition of space possible, projecting the original sound in forms accessible to human experience. The final stage of vaikhari sound offers infinite opportunities of permutation and combination arising out of one harmonious primal sound. In Tantric thought, sound without vibrations does exist. And this unstruck sound or anahata dhwani comes from the original pranava sound, which as the aggregate of all existing sounds gives birth to the cosmic process itself. Through its immeasurably powerful range and intensity, the anahata dhwani can create, destroy, and reshape the entire structure of the Universe. I would create an alternate implementaiton of capitalism with a new form of money not controlled by a central authority. More like a network of trust, with openness and transparency. No more profit, no more requirement (or potential) for perpetual exponential growth, just pure capitalism. If a venture is not doing something useful to humanity, it will have no support and won't get done. There won't be venture capital to finance useless wastes of time or insane destruction of the planet to serve short-term profit-motivated interests. But of course, i need to wait for the current implementation to collapse upon iteslf before I'll have enough willing participants in something new. 12 Sep 2005 @ 00:54 by maxtobin : What To Do In-deed! Or What a to do!! It is rather more a question of being in my view. Seek perhaps to pause (a moment to BE prior to the DO-ing); for instinct/action/reaction are directly at the focus of our SACRED NOW (lost in the conscious/unconscious issues in our tissues), a pause and an invitation to be at ONE (become the relationship rather than polarising within it) and ask "what is for the greatest and best good", a centering in the space of a quietened heart. This is how I try to BE, then my actions are in harmony with the ALL and are aligned in a heart centred (it has a scent too!!) flow. I believe that when a significant number of humans can do this on an ongiong basis we will BE the difference and become the 'New Civilization' we all have in our hearts as a compass to teach/guide us (the inner tutor = intuition)in this wonder-filled adventure called life. Blessings to all on this journey to the heart; our collective future becoming conscious awaits our awakening and remembering. questions that Buckminster Fuller raises. I am beginning to learn that when I "do" things more spontaneously, I am much happier and fulfilled. I feel that when I play, especially with my grandkids, who are totally uninhibited with their expressions, our unity is more than a slogan. While dancing, singing, painting, writing and drumming, playing with dolls and fire trucks, visiting museums and more, life is so simple, silly and fun. I would like to see more of this kind of doing in our schools and homes. Perhaps our planet needs to have more energy directed at helping families have the resources they need so that they can have more quality time with one another, have fun and be together in creative ways. I still love to hear children laughing and enjoying their lives. Just to follow up on the uatdpe of this issue on your web site and would really want to let you know how much I prized the time you took to produce this helpful post. In the post, you spoke on how to actually handle this problem with all convenience. It would be my pleasure to get some more tips from your blog and come as much as offer other people what I have benefited from you. I appreciate your usual great effort.